In an effort to create even better matchmaking, we are deploying an Early Access ELO skill and ranking reset. This means that everyone’s skill ranking (both Ranked & Unranked) will start you off fresh; as if logging into game for the first time. Now you may ask, “Why the Reset?” ”Hasn’t the system been improving the matchmaking over time?” And the short answer, Yes! We’ve been constantly improving our matchmaking, behind the scenes, throughout Early Access. And as you recall there were a number of different methodologies that were implemented including a time where players could select their own skill levels. More recently, we had bots help fill servers to alleviate gaps in player skill. In the background, we were adjusting the thresholds of ELO for humans & bots in order to find the best quality matches for YOU while trying to maintain appropriate wait times. This included waiting a little longer for fellow human players at your level before starting the match with bots. So the good news: with all of the data now available to us, our parameters for matchmaking have greatly improved! However, in order to fully utilize these lessons learned, we need your help! This skill reset will ultimately help us get YOU into quality matches faster. At the start of the reset, all players will begin with the same ELO which will cause some short lived growing-pains. Please bear with the matchmaking system as players, both advanced and beginner, make their journey up and down the ELO curve. It won’t take many games to move away from the central starting location so if your first game is a bit rough, rest assured, the games following should land you with your respective skill cohort quickly. This also means that ranked play will be reset, so it’s a wonderful opportunity to prove your skill in both Duel and 2v2 TDM in Ranked matches! ELO Skill Ranking goes Ground Zero for everyone on 26.07.2018 and from there you’re a beautiful phoenix reborn in the freshly gibbed ashes to go out and prove your pudding! DO I HAVE TO DO THE TUTORIAL AGAIN? No. Just queue up for your favorite game mode! DO I LOSE ANY OF MY IN-GAME LEVELING PROGRESS? No. If you’re Level 50 before the ELO Reset, you’ll still be Level 50 after it. WHAT ABOUT ALL OF MY UNOPENED LOOTBOXES & IN-GAME CURRENCY? What about em? No change here – you still keep everything you have. WHERE CAN I FIND MY LIFETIME STATS? Either in-game under your Profile Tab on the Main Menu, or on stats.quake.com you can still view all of your K:D, wins, loses, accuracy, Champion usages, etc. WHAT ABOUT MY RANKING BEFORE THE RESET? Just like disco, your old rank is dead. But now you have no excuse to not be #1 on the leaderboards, cause it’s a brand-new day in the arena! Good morning Sunshine! WHERE CAN I SEE MY OLD RANKING? The previous Rankings will NOT be in-game. However, if you had a competitive ranking before the ELO Reset, you should be able to refer back to it on our stats.quake.com. HOW DOES RANKING WORK AND WHAT DO THE NUMBERS MEAN? There are currently three separate rankings that players will earn during playing: Unranked as they naturally queue for public Solo/Team modes (invisible but still has a number attached for proper match making), Duel Ranked & 2v2 TDM Ranked. 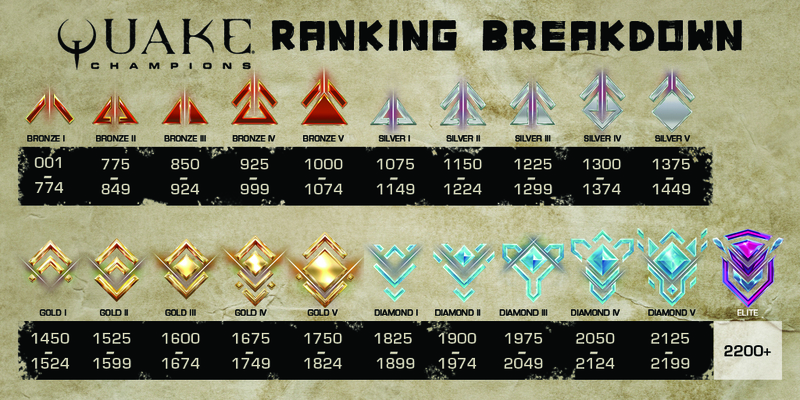 Each of these ranks will fall within the ranking range shown below, but all can be different. Per match +/-: (to paraphrase) Newer players will have greater mobility along the scale and will generally increase rank by winning and decrease rank by losing. As players progress they start to ‘find’ their rank, which means after a larger amount of games a player rank on the scale adjusts more slowly so they don’t swing wildly after losing or winning a single match. It is also possible to gain rank by losing to somebody who has a significantly greater skill rank and to lose rank by beating somebody with a significantly lower skill rank if the game is close enough.